NASA's New Exoplanet Hunter Just Buzzed the Moon and Snapped Its 1st Photo! 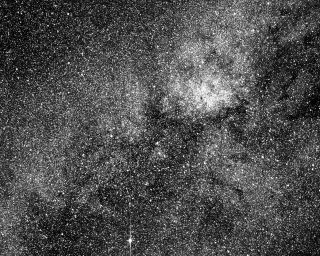 This test image from one of the four cameras aboard NASA's Transiting Exoplanet Survey Satellite (TESS) captures a swath of the southern sky along the plane of our galaxy. TESS is expected to cover more than 400 times the amount of sky shown in this image when using all four of its cameras during science operations. NASA's new exoplanet-hunting spacecraft has been busy. The Transiting Exoplanet Survey Satellite (TESS), which launched last month on a mission to find alien worlds circling stars close to the sun, zoomed within about 5,000 miles (8,000 kilometers) of the moon yesterday (May 17), NASA officials said. "This highly elliptical orbit will maximize the amount of sky the spacecraft can image, allowing it to continuously monitor large swaths of the sky," NASA officials wrote in a statement today (May 18). TESS will perform one last engine burn on May 30 to reach this orbit, they added. The spacecraft is expected to begin its two-year science mission in mid-June, after wrapping up calibration and commissioning work with its four onboard cameras. Such work is already underway. TESS has snapped its first test image with one of those cameras, NASA officials announced today. The photo, which was taken on April 26, is centered on the southern constellation Centaurus and shows more than 200,000 stars. An artist's illustration of TESS passing the moon during the spacecraft's lunar flyby on May 17, 2018. This maneuver provided a gravitational boost that placed TESS on course for its final working orbit. "The edge of the Coalsack Nebula is in the right upper corner, and the bright star Beta Centauri is visible at the lower left edge," NASA officials wrote in the same statement. "TESS is expected to cover more than 400 times as much sky as shown in this image with its four cameras during its initial two-year search for exoplanets. A science-quality image, also referred to as a 'first light' image, is expected to be released in June." TESS will precisely monitor stars' brightness, looking for tiny dips that could be caused by alien planets crossing the stars' faces. This "transit method" is also employed by NASA's Kepler space telescope, which has discovered about 70 percent of the 3,700 known exoplanets to date. TESS is expected to match or exceed Kepler's haul in total numbers, mission team members have said. And because TESS will focus on stars in the sun's neighborhood, astronomers will be able to study some of these newfound worlds in depth using other instruments. For example, NASA's $8.8 billion James Webb Space Telescope, which is scheduled to launch in 2020, should be able to probe the atmospheres of at least a few TESS planets, looking for water vapor, oxygen, methane and other gases that could be signs of a habitable (or possibly even inhabited) environment. The cost of the TESS mission is capped at $200 million, though launch services added another $87 million to that total, NASA officials have said. TESS lifted off April 18 aboard a SpaceX Falcon 9 rocket from Cape Canaveral Air Force Station in Florida.